This sleeveless garment was worn throughout the Middle Ages by Military and Civilians alike. We have designed them to compliment our "Medieval Gowns". The shoulders are angled to be worn either Over or Under your Armour. Surcoats can be worn by men or women! This earlier Male 12th-13th Century Cyclas was also a military tunic and was worn by many crusader knights over their armour. Very large arm openings and slit up the sides. Surcoat can be used to display heraldic devices. The 13th Century Male Cyclas, a military tunic, was worn by knights over their armour. Buttoned collar, can be worn with or without armour. This basic tunic with circular skirting is an excellent garment for displaying heraldry. Our 15th Century Surcoat is made from 100% cotton twill with open sides, black trim and black fluer de lis on front and back. Machine Washable. Made in the USA. The Crusader's surcoat is made from heavy cotton and is lined. It is designed to avoid excessive weight and heat retention. From the beginning of the First Crusade in 1095, to the legacy of crusading ideals of today, there is perhaps nothing more representative of that turbulent period than the knightly Crusader Surcoat. The Knight Templar Surcoat, with its distinctive red cross, was an instantly recognizable garment in the Crusades era. Our Knight Templar Surcoat made in a wool blend. The Hospitaller Surcoat, with its distinctive white cross, was an instantly recognizable garment in the Crusades era. Our Hospitaller Surcoat made in a wool blend. This Knight Templar Surcoat, with its distinctive red cross, provided a ready distinction between friend and foe in a melee. Crafted in lined, heavy cotton, this reconstruction is designed to avoid excessive extra weight and heat retention. The Hospitaller's surcoat is readily distinguished by the white Maltese cross on a black ground. Crafted in lined, heavy cotton, this Hospitaller Surcoat is designed to avoid excessive extra weight and heat retention. Belt not included. Arthur Pendragon Surcoat, the royal surcoat of King Arthur is made of quartered black and gold cotton velvet with three crowns of Arthur Pendragon emblazoned on the front. Braided gold trim, splits in front, back and sides. Our Medieval Surcoat comes with open sides, slit in the front and is knee length. We offer this surcoat in a wide variety of color choices to mix and match garment and trim. Machine Washable. Our Medieval Custom Surcoat comes with open sides, a straight Front and is knee length. We offer this surcoat in a wide variety of color choices to mix and match garment and trim. Machine Washable. Our Medieval Custom Surcoat Parti Colors (two colors) is Machine Washable. Comes with the same features as our TT-11 Surcoat. Sturdy Medieval Parti colored Surcoat with plenty of studs around the neck. Custom made your choice of colors, neck Trimmed in black. Full Length Surcoat is split front and back for ease of movement while riding and sword fighting. Rampant Lion Surcoat - The heraldic beast used in many Medieval coats of arms. Our Medieval Surcoat would look great for a Medieval Wedding or Tournament with open sides and sturdy cotton fabric. 6 colors to pick from. Sold at By The Sword, Inc. The Basic Medieval Tabard is inspired from medieval tabards and is a sleeveless, open sided garment worn over your outfit or armor. Tabard, from medium weight cotton, parti-colored, closed at the sides, and is open on the front. The Medieval Tabard is inspired from medieval tabards and is a sleeveless, open sided garment worn over your outfit or armor. 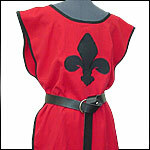 This tabard is made from a medium weight cotton that is similar to our medieval surcoats. The Undead Tabard is inspired from medieval tabards with a little darkness added. This unique garment can be worn under your dark knight armor allowing the demonic skull to show. Made from a medium weight black cotton.